Be the first to share your favorite memory, photo or story of Grazyna. This memorial page is dedicated for family, friends and future generations to celebrate the life of their loved one. 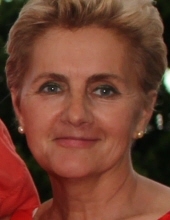 Grazyna G Klim, age 57, passed away peacefully after a long struggle with cancer on April 8, 2019 at Hunterdon Medical Center in Raritan Township, New Jersey surrounded by her daughter, son and those that loved her. She was born in 1962 in Poland. She spoke multiple languages and lived in Italy for a few years where she spoke such perfect Italian, nobody knew she was actually Polish. While working for the Polish airlines she met her husband, James Klim, who was an airline captain and moved to the United States. She went back to school to become a nurse and worked in the Neonatal Intensive Care Unit. She cared deeply about her patients and would take care of mother’s after her shift and they would talk highly of her, especially with her expertise. She made everyone laugh with her comments and joked always with nurses and helped in the unit. She had knowledge of many exotic plants, and her home always looked like a tropical paradise with her green thumb. She was a natural born baker and made everything from scratch, even when she could not taste her creations, they came out absolutely amazing. She loved spending time in Miami, Florida on the beach, splashing in the tropical waters, exploring tropical forests and imaging the home she would someday have on the water. She is survived by her daughter Jammie and son James. A memorial service will be held on Friday, April 19th at her home at 29 Cratetown Road in Clinton Township, New Jersey, from 5-8 PM. "Email Address" would like to share the life celebration of Grazyna G. Klim. Click on the "link" to go to share a favorite memory or leave a condolence message for the family.